Term three has been incredibly busy as we head into the business end of the year. There have been many exciting events taking place in the College which we celebrate in this Newsletter. We are now busily readying ourselves to celebrate the many student successes that we have had over the year at our three prizegivings. Junior (Year 7–10) is at 1.00pm on Thursday 10 December. I would encourage parents and interested members of the community to come along and support these events. I would like to take this opportunity to thank parents and members of the community who have helped coach, manage and transport sports teams. We could not have as many students participating if we did not have your support. I would also like to sincerely thank the many businesses and individuals who have continued to support us over the year in various ways and, most recently, to those people who have supported our upcoming magazine. Your generosity and goodwill goes an incredibly long way towards helping the College support and encourage the wide-ranging talents of our students. Ōtaki College recently celebrated the cultural diversity of the College itself and that of the wider community. Ōtaki has an amazing cultural history. It is the second oldest town in Aotearoa, NZ and dates back to its founding father — Te Rauparaha. Ōtaki was initially designed as a Māori centre but as whalers increasingly spent time in the region in the off season, the two cultures blended. Since then we have seen Chinese and Italian families taking up residence to run market gardens, earning Ōtaki the nickname — “The Food Basket” — of the Wellington region. In more recent times other cultural groups have come into the town, but true to Ngāti Raukawa and Ōtaki fashion, they have all been welcomed and looked after so that they can grow and thrive. Culture week at Ōtaki College is all about celebrating our history and the cultures that make the College a place with a vibrant whanau atmosphere. Following the success of last year, the Cultural Committee of the Student Council were keen to plan and run Culture Week as a fun way for students to celebrate cultural diversity at school. With financial support from The Home & School, Indian, Chinese and Kiwi cuisine were sampled by about 250 students over two days. Culture Week began with a performance from the Pasifika Breeze group and items from the Ōtaki College Kapa Haka Roopu. A cultural online kahoot quiz was an opportunity for students to test their knowledge and use their chromebooks at the same time. Japanese students gave out origami cranes and Korean students gave out traditional transfers. 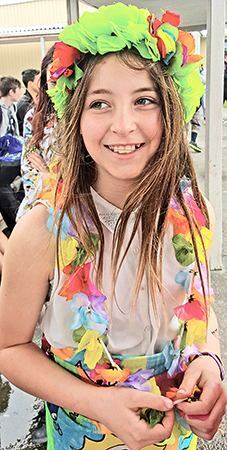 On the last day houses competed in an obstacle course relay and there was a catwalk where students modelled their classes’ lavalava designs. Part of the PB4L lesson for the week was about OC Pride where we build our mana by showing empathy and cultural awareness of others. 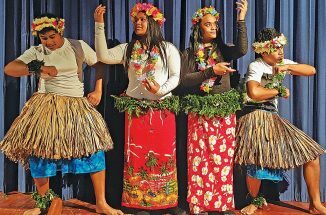 Pasifika Breeze is a group of students who represent their Pasifika groups from Tuvalu, Rarotonga and Kiribati. They intertwined Tahitian, Tuvaluan and Rarotongan dance moves into their performance. Year 12 Otaki College student, Brody McConkey (16), has been around Motorsport since the age of 3, and has been racing cars since 2013. It has become his main passion and career focus, and he is wanting to pursue it on the international stage. His ultimate goal would be to compete in the Indy Car series in the USA, or to be a Formula One driver. Brody believes that if you “don’t stop until your idol becomes your rival” you can reach any goal. He has certainly shown his determination to make his dream come true. Recently Brody was given the opportunity to test at Manfield with the Toyota GT86 racing car. He was then flown to Auckland to test the same race car at a different venue, being Hampton Downs racetrack. Toyota New Zealand were impressed with Brody’s performance, and as a result of this, Brody has been offered sponsorship from Toyota to compete in the 2015/16 Toyota Racing GT86 Championship. He was one of two drivers offered this out of fifteen. This sponsorship is to the value of $30,000, half of the full cost to compete. At this stage there is still the question of further funding to enable Brody to accept this offer, but he is hopeful to raise the other $30,000. The Championship consists of 6 rounds, with the first round being the backup class to the V8 supercars at Pukekoe Park Raceway on the 6th – 8th November 2015. On Wednesday, 9th September, primary schools in the Ōtaki area brought teams of Year 5 and 6 students to Otaki College to take part in the inaugural, annual Einstein Shield Problem Solving Challenge. This was a competition involving mathematics, logic and construction problems that were to be solved in their teams, over the course of the morning. The competition was open to all Year 5 and Year 6 students in the Ōtaki area. A preliminary quiz was held during the third week of this term, as a qualifier to select the top three Year 5’s and top three Year 6’s from each school in the area. These students were then invited to attend the Einstein Shield, to represent their respective schools. Each team was assigned a Year 9 Ōtaki College student as a mentor. The purpose of the competition is to foster a passion for mathematics and problem solving, especially that outside of a classroom context, to build on relationships between Ōtaki College and contributing schools staff and students and to challenge students through group activities. There was an awesome response to the qualifying quiz with over 140 entries from five local schools. All of the schools fielded highly competitive teams, with wonderful abilities and inquisitive minds. The competition was hotly contested, with almost every team in with a chance to win coming into the last challenge. The students showed great problem solving skills and were enjoying all the tasks given. Congratulations go to Te Horo School for being the 2015 winners of the Einstein Shield and the holders of the trophy for the next year.